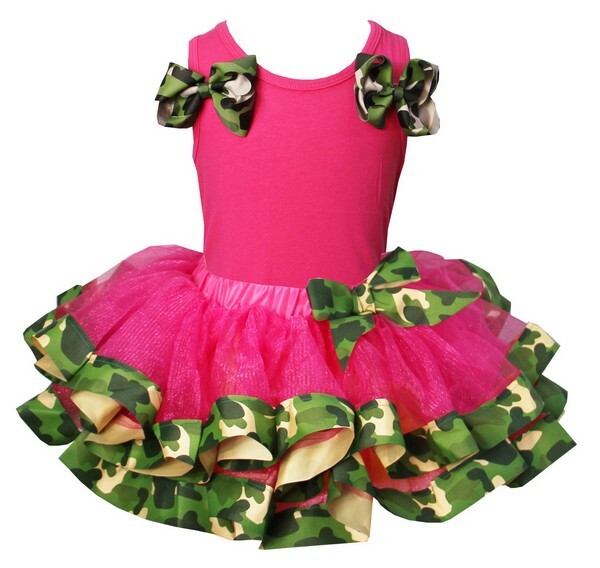 Your little girl will look tutu cute in our so adorable and classy pink camo print satin ribbon trimmed tutu outfit. The tutu is made with yards of polyester chiffon. The ribbon is sewn onto the tulle for added quality and durability so it will not come untied. The tutus waistband is made with stretchy elastic for added comfort and growth. We recommend wearing something underneath like leggings or bloomers. Size: 100 14.5" Long (age 1-2) Chest is 20" - 21"
Size: 110 15.5" Long (age 3-4) Chest is 21" - 22"
Size: 120 16.5" Long (age 5-6) Chest is 22" - 23"
Size: XS 7" Long (age 1-2) Waist is 18" - 22"
Size: S 9" Long (age 3-4) Waist is 19" - 23"
Size: M 11" Long (age 5-6) Waist is 20" - 24"
Please allow up to 2.5 weeks for your order to be created, plus shipping time. Rush shipping is available for an additional fee of 20.00. If you'd like your order rushed to you, please click on the link below and your order will be processed within 7 business days plus shipping time. Our Business days are Monday thru Friday.